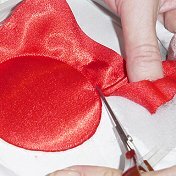 Here you will find photos of projects, projects and instructions of embroidered items done by Petro and our customers. Please mail us if you would like us to add your project here. 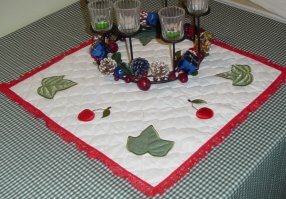 The Christmas Applique designs were used to create the runner at the end of this page as decoration for a Christmas table. I used satin fabric and batting (130 gsm). 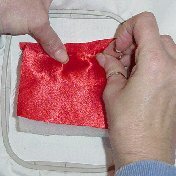 The batting is used to give the applique designs a puffy look. The designs can also be stitched out without using the batting. 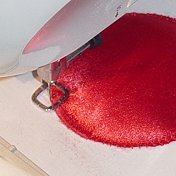 The fabric is trimmed to size after the basting stitch. I have also included a set of instructions with your color chart. Step 1: Place two pieces of 130 gsm batting and one layer of fabric on top of applique position. 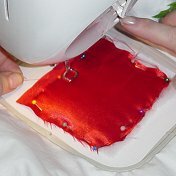 Step 2: Pin fabric and batting in place - remember to pull fabric really tight to avoid creases. Step 3: Attach hoop to machine and stitch out trim line. 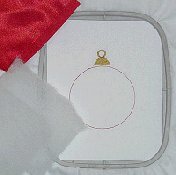 Step 4: Remove hoop (don't remove fabric from hoop) and cut batting and fabric among trim line. 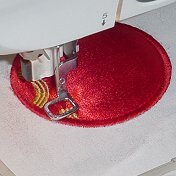 Step 5: Attach hoop to machine and stitch tack down and satin stitch. Step 6: Finish off design. 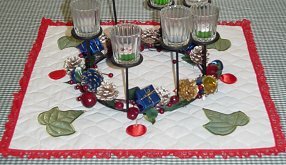 Project idea using the Christmas Applique designs. All of the designs on designsbypetro.com are copyrighted. 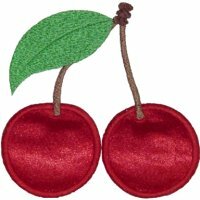 You may use these designs for your personal embroidered items, embroidered items to sell, and embroidered items to give as gifts. The rights to the designs themselves remain with designsbypetro.com. You may not transfer, share, or sell the actual design files without written permission from designsbypetro.com.